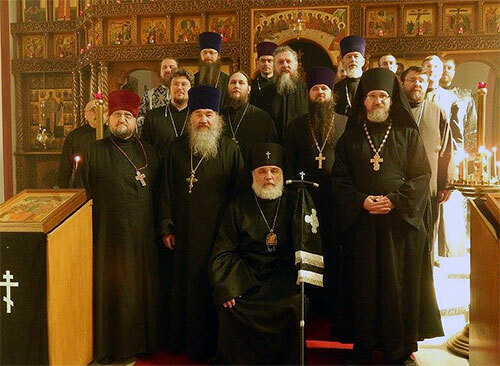 We, the clergy of the Diocese of Montreal and Canada of the Russian Orthodox Church, gathered together in the capital of Canada, Ottawa, Ontario, at the parish of the Protection of the Virgin Mary, under the chairmanship of his grace Archbishop Gabriel. It is meaningful that in 2015, when the Church is celebrating the 1000-year anniversary of the repose of St. Vladimir, the baptizer of Russia, we held our annual clergy retreat in the Ottawa parish whose church was built as a memorial to the baptism of Russia. The Church beautifully sums up how we should spend our time during this Lenten season in the following hymn: “Come, ye faithful, … let us cast away every unjust accusation against our neighbour, … Let us lay aside the pleasures of the flesh, and increase the spiritual gifts of our soul. Let us give bread to those in need, and let us draw near unto Christ, crying in penitence: O our God, have mercy on us” (Stichiron at “Lord I have cried” on Friday of the first week of Great Lent). We thank God that during our gathering we were able to put some of these words into practice by cleansing our souls through the sacrament of confession and growing spiritually through prayer at the divine services and Communion of Christ’s Body and Blood at the Liturgy of the Presanctified Gifts. We call upon our flock to remember the central importance of the Divine Mysteries in our spiritual lives and to prepare for Communion accordingly, through fasting, prayer both at home and at church and heartfelt confession. With sorrow we observe that the conflict in eastern Ukraine has not completely subsided and that Orthodox Christians as well as other peoples continue to suffer both physical and spiritual hardships. We fervently pray that our Lord grant not only peace to Ukraine, but also that He strengthen the canonical Church in that land. The recent decision of the Supreme Court of Canada to strike down the ban on assisted suicide brings pain to our hearts. At the church services of Great Lent, we are constantly reminded of the physical and spiritual struggles that the martyrs endured for Christ. We call upon all God-fearing people to cherish life, the most precious gift given to us from God, and to emulate the holy martyrs by enduring until the end any suffering that the Lord may send us. Only in this way will we show our spiritual courage and defeat the devil. Despite these sad, events the Church, including our diocese, continues to be like that candle on a candlestick that gives light to the whole house (Matthew 5:15). With joy we see that our St. Tikhon Patriarch of Moscow Russian Orthodox parish in Waterloo, Ontario has acquired a new and permanent church building. It is fitting that this has happened in the year when we celebrate the 90th anniversary of St. Tikhon’s blessed repose. We are optimistic that, with God’s help, our new communities in Red Deer, Alberta and Saskatoon, Saskatchewan will continue to grow and with time will flourish, just like the parish of St. Tikhon in Waterloo. We also give thanks to our Saviour and His most pure Mother that this year our parish in Ottawa, Ontario is celebrating 50 years of existence, while the parish of All Saints in Calgary, Alberta is marking its 85th anniversary. We also note that the annual music conference of the Russian Orthodox Church Outside of Russia will be held in Calgary this year. Finally, we ask that all faithful members of the Russian Orthodox Church join us in praying for the health of our beloved first-hierarch Metropolitan Hilarion. May the Lord God bless all of you and give you the strength to complete this lenten season in a spiritually profitable way and joyfully meet the bright feast of Pascha.